There are many occasions which require a floral garnish to compliment your outfit. Occasions such as ceilidhs, school dances and wedding ceremonies to name a few so if you are in need of a flower to wear, look no further as florists Aberdeen is the place for you. Our Aberdeen florists have over forty years of experience in the floristry business under their belts so you can be rest assured your orders will be arranged by capable hands. First and foremost, all of the flowers our Aberdeen florists work with have been imported from a number of different locations, including Holland. Holland is a region of the Netherlands renowned for producing some of the finest flowers in world which means that the quality you receive from four seasons florists is also of the highest calibre. Combined with over four deliveries per week, not only are these flowers of the best quality but they are also the freshest. 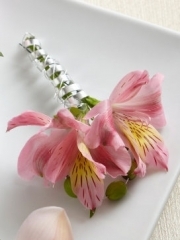 This means that the flowers have a high longevity so they will stay perfectly fresh for the entirety of your occasion. Four seasons florists Aberdeen have a wide selection of flowers to wear designs so no matter what it is you’re after, we are sure to have it. On our website, you are able to browse through the selection of flowers to wear we have on offer however if nothing catches your eye, then you are able to use our bespoke service. Through the bespoke service, you are able to specify what flowers you would like as well as colour preferences and so on. Once the Aberdeen florists have all the details they need, they will craft a floral design that fully reflects all of your ideas. The Aberdeen florists are also able to advice you what flowers would be most suited to be worn as some are more delicate than others. 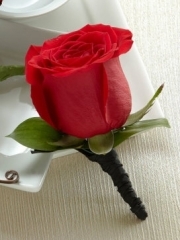 At flowers Aberdeen, we want nothing more other than to provide you with gorgeous flowers of the best quality. There are many different floral designs when it comes to wearable flowers. 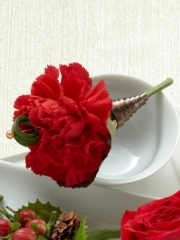 For example, there are corsages on offer which are typically worn by women. 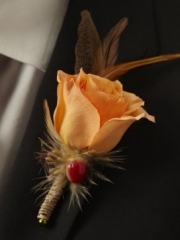 We have corsages which can be worn on your wrist or pinned to your dress. 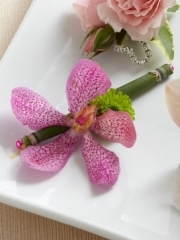 Our corsages generally consist of a gorgeous flower head, for example that of an orchid or a rose, which is nestled amongst foliage and ornaments. The wrist strap itself comes in different sizes and makes but all are sturdy so you don’t have to worry about it falling off or apart. There are also buttonholes for men which can sharpen any suit. Then we have floral headpieces on offer which are very popular for weddings. All of these wearable flower designs can be tailored to compliment or match your outfit using the bespoke service as mentioned before. If you are looking for a wearable flower design but are stuck for ideas, you are able to discuss further details about your flowers to wear in person, by phone or email. If you are organising a wedding and require several different flowers to wear designs then you are able to book a wedding flowers consultation to talk to an experienced florist who has dealt with many weddings. No matter what it is you’re after or what your request may be - whether it be a particular floral design or flower delivery Aberdeen - the team at Aberdeen flowers will always do our absolute best to fulfil all of your requests.